This post is my contribution to the TCM Summer Under the Stars Blogathon hosted by Jill of Sittin' on a Backyard Fence and Michael of ScribeHard on Film. 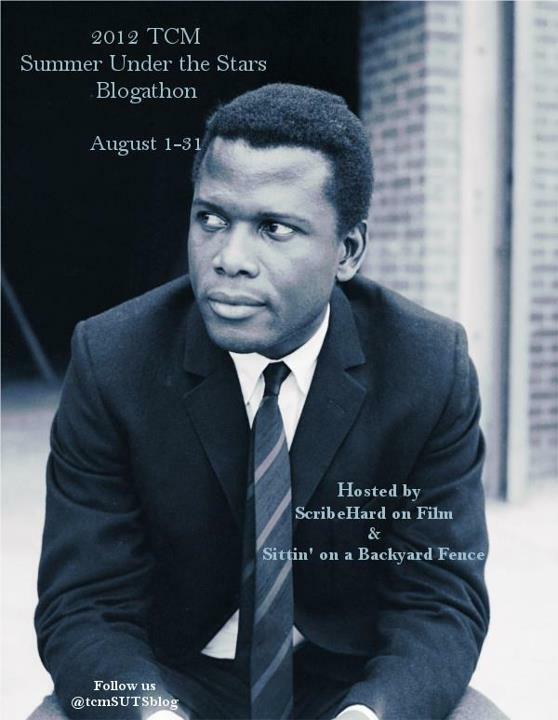 Sidney Poitier is the featured actor on Tuesday August 7th on TCM. 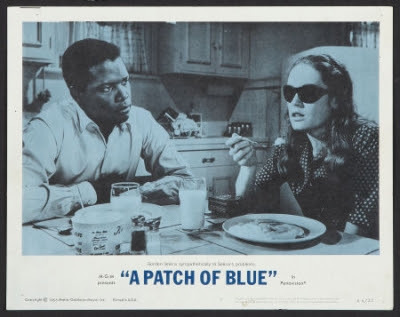 If you only watch one Sidney Poitier film on Tuesday’s TCM Summer Under the Stars special, make sure it's A Patch of Blue (1965). This sensitive ground-breaking film features fine performances from Shelley Winters, then-newcomer Elizabeth Hartman and the great Sidney Poitier. A Patch of Blue is one of those films that merits repeat viewings. Every time I watch it, I’m reminded of several things: the importance of kindness, the injustice of racial prejudice and the blindness of love. Selina D’Arcy (Elizabeth Hartman) is a blind girl living with her mother Rose-Ann (Shelley Winters) and her grandfather Ole Pa (Wallace Ford), both of whom are consistently drunk and getting into trouble. Rose-Ann’s promiscuity has always been the source of pain and suffering for Selina. When two of Rose-Ann’s lovers get into a quarrel, a bottle of acid is thrown by accident at 5 year old Selina leading to her permanent blindness. A Patch of Blue refers to Selina’s happy memory of seeing the color blue before she went blind. Selina is not allowed to have an education and is forced to keep the home, make dinner and work on beading necklaces and jewelry to supply more income to the family. As Rose-Ann gets older, she becomes more and more jealous of Selina’s youth and beauty and is constantly finding ways to bring her down. Then one day Selina meets Gordon Ralfe (Sidney Poitier) in the park. He’s the first person to be kind to her. Genuinely kind. He helps her with her beads, pulls a caterpillar out of her shirt, gives her pineapple juice, teaches her how to use a payphone, corrects her grammar, and more. Rose-Ann had worked so hard to keep Selina paralyzed and sheltered. It’s much easier to control someone when you deny them the tools to defend themselves and become independent. But it only took one kind person to give Selina a new chance at life. Sidney Poitier’s Gordon is the catalyst who makes Selina’s world open up with many possibilities. A handsome 38-year-old Sidney Poitier is a marvel to watch. He’s tall and graceful, has beautiful skin, bright eyes and a smile that could light up a room. Sidney Poitier’s Gordon is my favorite character in the film. Gordon could have continued his walk through the park not paying any mind to Selina. Instead, he took pity on her and decided to help her out. If anything this world needs it’s more kindness. I really gravitate towards characters such as Gordon whom despite their own problems extend kindness to others in need. Gordon’s generosity towards Selina always makes me cry. I mean c’mon! She’s got a sad bag of crackers for lunch and he takes pity on her and leads her to the local deli for corned beef sandwiches and pineapple juice. He could have just left her to her sad lunch but instead he treated to something better and taught her how to get out of the park and navigate traffic too! He doesn’t baby her. He enables her to be independent and to do things on her own. And that’s key! It’s one thing to be nice to someone and it’s another to empower them. The film is ground-breaking because it shows, for the very first time, a kiss between a white woman and a black man. According to IMDB, this scene was cut out of versions shown in certain states in the American south because at that time miscegenation was still illegal there. To me this film is especially important because it shows how two people can fall in love regardless of race. Selina’s blindness demonstrates how love itself is blind and what’s important is who we are inside. Her naïveté about society's rules regarding race could fuel discussion of why those rules ever existed. While it was Shelly Winters who won the Academy Award for her performance, I think there is a lot to Sidney Poitier's sensitive portrayal of Gordon Ralfe. This film made me fall in love with Sidney Poitier and I've been a happy fan ever since. Thanks to Jill and Michael for hosting the TCM Summer Under the Stars (SUTS) blogathon and for letting me participate! A great blog! I've been reading you for awhile, and you have exquisite taste in films. Turner is really having a great summer. They recently sold out a one-night-only screening of "Singin' In The Rain" in theaters. This fall, they're teaming up with Universal, in honor of their 100th anniversary. Four classic Universal films are getting the big screen treatment, including one of my favorites, "The Birds." I'm glad to have TCM back because Turner really knows how to do August! I love SUTS. Thanks for the info and the link! great review Quelle! i am a big fan of this film, its my fave of the Potier films i've seen to date. its so well-written, acted and directed, and yes Sidney has a magnetism that is inescapable! star power! i consider it one of the better films of the 60's...def need to see it again sometime, its been a while. Paulie - I'm so glad you are a fan too! You are right, it's well-written, well-acted, well-directed. It's not heavy handed either which I like. I don't feel like I'm beaten over the head with a message. Instead I just feel for the characters. I'm angry at Rose-Ann, I'm sad and hopeful for Selina and I'm just in love with Gordon (Sidney Poitier). And I think it doesn't fall into a lot of the 1960s cliches which helps it a lot! Great write-up...I've never seen this before, you've piqued my curiosity!! Thanks so much Joel! I hope I piqued your curiosity enough that you'll give it a try. I'm definitely a champion for this film. This is a film I'm not familiar with either. Will head over to my DVR and click "Record." You recently mentioned in a Tweet liking grocery stores and similar things in movies. Me too! Great screencaps above in that regard. Laura - Oh I'm really excited for you to watch this. I'm really hoping you like it. You like grocery stores in old movies too? I love this one in particular as there is a very fun light-hearted scene when they go "marketing" ha! And it's funny to see how much 1960s America depended on canned goods. What a lovely, evocative write up, reminding me of a movie I haven't seen in years. When I first saw it, on TV, as a girl of 11 or 12, I'm afraid perhaps the kiss was cut out because I didn't get that they were romantically involved, at least not on his end. I do remember a speech where he explains different kinds of love. ANYWAY, I remember, at that tender age, wishing Sidney Poitier was my dad. He spoke to her with such patience, but without condescension (a point you make in your post). This is a great piece! I have to admit I've never seen this film. I managed to record it on Poitier's day, so I hope I can watch it soon. Thanks for a lovely contribution to the blogathon! And sorry it's taken me a bit to get over here. So many pieces to read through and comment on! This is without a doubt one of my favorite films! It played last night on TCM and again this afternoon here in Thailand. It is remarkably moving --- living during the period in America and the horrible hate and discrimination and having always been in interracial relationships --- I find it enormously touching and powerful. Our world today is so full of hate because of race and religion --- this should be required viewing for everyone!!! The entire cast deserved Academy Awards --- I met Shelley Winters one evening in Los Angeles --- her car's license plate was 4OSCARS (though she won 2 she was nominated for 4) I was on the sidewalk and the car pulled over, the passenger window rolled down and she asked for directions. I couldn't help but tell her how much I've enjoyed her career but it was the movie "A Patch Of Blue" that makes such a huge statement. Maybe it was because my boyfriend and I were walking together hand in hand, he being Afro-American and me -- Hispanic that led her to stop. A memory captured in time without a cell phone to record it. She smiled and winked, said thanks and "you boys have a good night"! A whole new world beckons for Selina because of Gordon's kindness. A Patch of Blue is a great film.